The Duplo 350C Booklet System is a high production collating and bookletmaking system that boasts one of the smallest footprints. The mid-range, fully-automatic Duplo System 3500 incorporates up to two DSC-10/20 Collators with the DBM-350/T Bookletmaker & Trimmer. 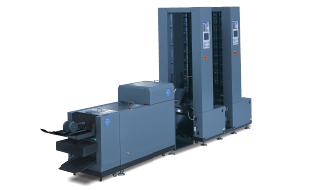 Offering stitching heads, speeds of up to 3,000 books an hour, and fully automated set-up, the DBM-350/T is an extremely productive and professional solution. The ability to handle set-by-set and sheet-by-sheet output with equal ease means it can be connected not only to Duplo's DSC-10/20 collators but to its sheet feeders as well. Interested in the Duplo System 3500?